Br Henry O'Connell received the habit of St Philip on Monday, 16th March at St Wilfrid's; our second novice for York and the first to be clothed in the habit there. Please remember Br Henry in your prayers. 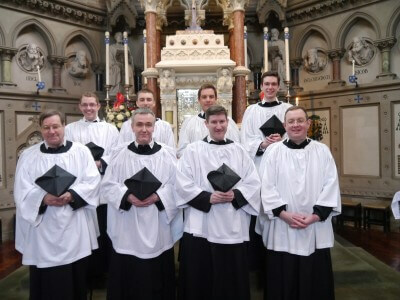 Br Henry is in the back row, first on the left and pictured with other Fathers and Brothers of the Oxford Oratory. 16th March is an excellent day for an Oratorian clothing, since it is the anniversary of the famous Massimo Miracle in Rome when St Philip raised the young Paolo Massimo from the dead. The Massimi family were great devotees of St Philip, and when fourteen-year old Paolo lay dying, our Holy Father was summoned, but was saying Mass and so arrived too late. Nevertheless, his prayers raised Paolo from the dead: the boy then asked to go to confession. The saint sent everyone from the room, heard his confession, and then talked to Paolo for about half an hour about the joys of Paradise. 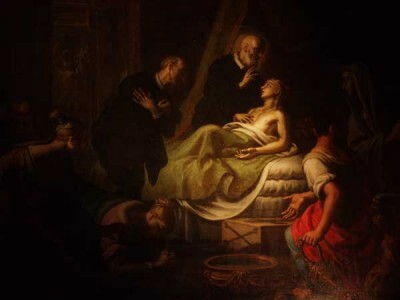 After St Philip twice asked Paolo whether he died willingly, the boy died for a second time, peacefully and joyfully. The event is still celebrated annually in Rome at the Palazzo Massimi where the house is open to the public for one day only and Mass is celebrated in the family chapel.